Ok, you’ve just bought a new scanner and brought it back to your workshop. You’ve hooked it up to your computer, installed all the software and after scanning a few photos, you open up those image files and notice the color of those images do not match the originals. What is going on? I believe this happens to most of us. Because we are so excited with our new toy, we might just skip past the most important step: Color Calibration. This month we will discuss some easy and inexpensive ways to calibrate your scanner. To begin, you should purchase a color calibration print from a professional photo equipment retailer. 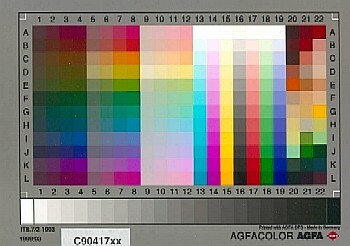 The print itself is a referenced color chart that is printed on real photo paper. It will make this process easier. See Fig.1. If you can’t find them, you can use a good quality vinyl color chart for now. Let’s start with the monitor: Use Fig.2 as a reference to adjust you monitor brightness and contrast. The goal here is to be able to see Black and White and all shades of gray in between. From Windows®, adjust your video card output to either 24 or 32 Bit Resolution. Set the monitor’s Contrast to the Maximum. Adjust the Brightness little by little until you see White on the left and shades of Gray and Black on the right. Note: The last few shades of dark gray are very close to black. You will need to examine them closely until you can see them. But don’t over do it! If you adjust the Brightness too high, you will see that the entire screen looks like it has a layer of fog or haze over the image. After your monitor’s Contrast/Brightness is set, you are now ready to scan the vinyl chart or the color print. Use the Preview function to view your image’s location. If your software has a feature called White Point adjustment, use it to select the White part of the image and set it. Refer to your owner’s manual on how to set the White Point value. Scan the photo and save it in either TIFF or Bitmap file format. Open the image file with your image editing software. Now you can see how far off the colors are from the original. If you don’t see any difference, then you’re done. If you see the difference, make a note on which color is too much and which is not enough. These colors are based on the combination of RGB (Red, Green and Blue). Then go back to your scanning software and use the color adjustment feature to adjust those colors. (Hints: Make a note on the default values and how much you have adjusted on each color. Some software use percentages and others use numbers so you can use that as your reference. In case you didn’t like the result, you can always go back to the factory default values and start all over again. After each adjustment, you should scan the same photo or chart again and view it. Repeat steps 5 & 6 until you get the colors as close to the original as possible. There are a few other ways to do this. One of them is to use a spectrometer. If you really have to get the absolute correct colors, then you should look into one. They start around $750 each. But a spectrometer can also help you to calibrate your printer, so your entire system will be matched. There are other ways to calibrate your monitor. Some graphic/photo editing programs have built-in Color and/or Gamma adjustment features. For example: Adobe® Photoshop®, Corel® Photodraw® and Paintshop Pro® have those features. You might ask “Why not adjust the Color and/or the Contrast/Brightness after the scan?” The answer is that no matter how you adjust the scanned image, you cannot get a better result than what you have already scanned. This is why we should adjust all settings before the final scan. Description: Plenty of resources and useful links. Hope you enjoyed this article and that the information helps!